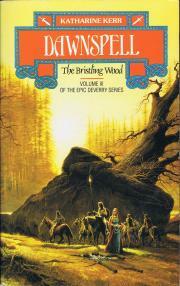 Anm: I USA heter boken The Bristling Wood, i UK heter den Dawnspell: The Bristling Wood. Return to the fantastical land of myth, magic and passion. Over a thousand years ago the People of Deverry were driven from their splendid kingdom by their enemy, the Hordes, and forced to find sanctuary in the remote forests in the east of their lands where they eventually settled. Succeeding generations remembered these terrible events as the Burning - and they never forgot the cities, towns and marvels of the far, far west. 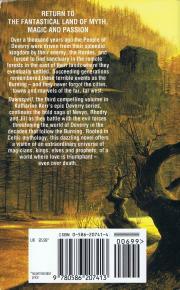 Dawnspell, the third compelling volume in Katharine Kerr's epic Deverry series, continues the bold saga of Nevyn, Rhodry and Jill as they battle with the evil forces threatening the world of Deverry in the decades that follow the Burning. Rooted in Celtic mythology, this dazzling novel offers a vision of an extraordinary universe of magicians, kings, elves and prophets, of a world where love is triumphant - even over death.